It feels like a century, but last weekend marked just a year since Fidel Castro passed away. Twelve months ago, Castro’s death seemed the logical bookend to an era in which old bilateral hostilities were disappearing for good. Yet, over the course of the surreally long year that followed, diplomatic normalization between Cuba and the United States was increasingly thrown into uncertainty. The election of Donald J. Trump as President of the United States ushered in a reversal of many of the signature policies of the Obama era. Possibilities for U.S. travel to the island are once again restricted. Incipient economic partnerships have been put on hold. Most bizarrely, the Cuban government has rejected accusations of complicity in as yet unexplained “sonic attacks” on U.S. diplomats. Few could have imagined such a “post” to the once hopeful world of rapprochement. Few, that is, except probably Fidel Castro himself. Much can, has, and will be said about the stunning diplomatic volte-face we are now witnessing. Internally, Cuba is also undergoing an uncertain transition as Raúl Castro, Fidel’s brother, is expected to step down in a matter of weeks. As historians, however, we are also interested in understanding the consequences of these shifts for the study of Cuba’s past. Where have the dizzying changes of the last few years, and especially during the year following Fidel Castro’s November 25th death, left historians of the Cuban Revolution? And how, too, might they shape Cubans’ feelings about their future? On the one hand, the final passing of the Revolution’s historic leader may have opened space for Cubans, and Cuban historians, to finally come out from under Fidel’s shadow. On the other, predictable, albeit at times still heartfelt, displays of hagiography risk once again crowding the field. As the faithful chanted “I am Fidel!” at various stations along the official state funeral last November—or as Cuban exiles in Miami banged pots and pans in celebration of his death—one could have easily taken the slogan as the official mantra for Cuban history and politics. In memorial services, concerts, and social media hashtags on the island this week, this script has appeared to play on repeat. The conflation of leader and national epic (or tragedy) dates to the very moment when the Cuban rebels first erupted onto the island’s political stage. Fidel and the barbudos not only assumed political power in 1959; they also effected what historian Louis A. Pérez, Jr. has called an “appropriation of history.” “History will absolve me,” Fidel claimed in 1953 following his failed attack on the Moncada Barracks; “100 years of struggle” linked the launch of Cuba’s independence wars to a socialist centennial, he argued in 1968. In these and other speeches, the Revolution’s chief was the main architect and beneficiary of a rendering of Cuba’s past as deferred deliverance. And plenty of Cubans, at least at the start, were eager to believe. Cuba’s official history thus yoked a cyclical saga of political failure to a vision of final triumph in the present. Fidel Castro, as either the guarantor or (to his critics) traitor of this legacy, naturally received the lion’s share of the ink spilled. Even a cursory search of the Internet calls up hundreds of biographies published over the years—and that’s just in English. If historians of the Soviet Union today are still churning out books about Stalin, the Fidel Castro profile industry may be in its infancy. New Yorker correspondent Jon Lee Anderson is working on a new biography as we speak. The new Trump moment in U.S.-Cuban relations may further feed this Fidel-centric impulse. If there is another political paradigm to which the comandante’s legend is linked, it is steadfast resistance to the United States. Barack Obama admirably, if imperfectly, sought to break with this pattern, calling on both nations to leave the past behind. Not surprisingly, a then retired Fidel greeted such overtures with a sarcastic, untrusting rebuff. With President Trump reviving some of the ineffectual policies and overcharged rhetoric of old, the wisdom of Fidel’s wariness may attract new adherents. But as the first anniversary of Castro’s death prompts a new wave of reflections on the enduring relevance (or not) of his ideas, we must also remember that “The Revolution” is hardly reducible to one project or individual. The history of the Revolution must push beyond the official story, with its singular cast. From early 1959 to the present, there have always been competing forces present in the revolutionary political arena. Most challenging of all, historians also need to grapple with the experiences of ordinary people. For the Revolution is also the story of those who lived under its persistent, quotidian, but not necessarily all-encompassing weight. Cuba’s history ought not be written in the shadow or mold of U.S. interests either. At times, it can feel like the saga of the Revolution hovers precariously between two poles, with the towering influence of Fidel Castro on one hand and the malignant threat of the United States on the other. But this seeming opposition between socialist values and feared capitalist penetration hardly accounts for the grey zone in which Cubans have often found themselves, or the uncertain political ground most Cubans occupy today. If anything, Cubans have confronted more ideological dissonance than continuity over the past three decades. Ever since the fall of the Soviet Union, Cuba’s government has cautiously embraced foreign capital, in the tourist industry especially. Space for private enterprise, more recently in collaboration with U.S. companies like Airbnb, has also grown. Such moves have benefited some Cubans considerably, while leaving others in state sector jobs behind. Either way, these developments sit at odds with both the original project of revolutionary socialism as articulated in the 1960s and the broader spirit of egalitarianism that fueled it. Icon or Brand? José Ángel Toirac, “Marlboro,” from the series “Tiempos Nuevos,” 1996. In the 1990s, Cuban artist José Ángel Toirac brilliantly satirized this incomplete but undeniable reengagement between Cuba and global economic norms. 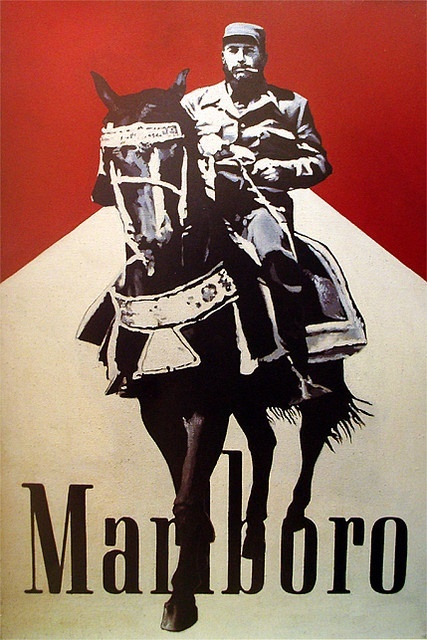 In his “New Times” print series, Toirac imagines Fidel as the star of a series of magazine advertisements: Fidel as Marlboro Man, for example. One subset of images repurposes iconic photos of the Comandante en Jefe as the visual content of perfume ads, including, most poignantly, “Eternity” by Calvin Klein. Perhaps Fidel Castro will endure in the world of commodity capitalism, the piece sardonically suggests. Or perhaps he and the Revolution were little more than brands all along. One year after Fidel’s actual disappearance, with the Cuban state resisting a full dive into market reforms while insisting on political continuity, the verdict on Toirac’s divergent predictions is still out. Fidel Forever. José Ángel Toirac, “Eternity,” 2000. There are few notions more anathema to historians, of course, than timeless time. Yet Toirac’s juxtaposition reminds us that revolutionary mythology and capitalist iconography also converge in an equally dangerous vision of a timeless Cuban present. Both Fidel as nationalist totem and Fidel as marketing hook occlude the many other histories of the revolutionary era still to be written, not to mention the futures many Cubans hope to forge. And these histories of what was—-and what might be—must feature ordinary citizens not as handmaidens to anyone’s political epic, but on their own terms, and as themselves. Michael Bustamante teaches Latin American and Caribbean history at Florida International University. Jennifer Lambe teaches Latin American and Caribbean history at Brown University and is the author of Madhouse: Psychiatry and Politics in Cuban History. Together, they are co-editors of The Revolution from Within: Cuba, 1959-1980, under contract with Duke University Press. Title image: Fidel Castro’s funeral procession, Sancti Spíritus Province, Cuba, 2016.